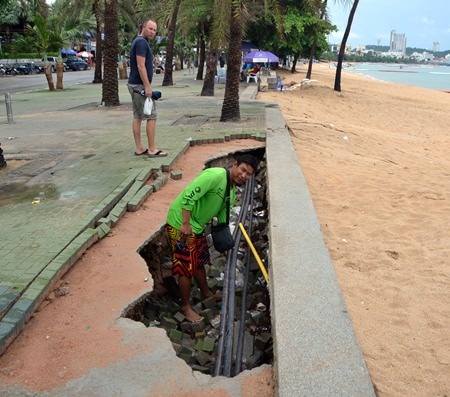 Repeated waves of torrential flooding are eating away at the recently rebuilt Pattaya Beach promenade. Numerous large holes have appeared in the brick footpath, which also has sunk in other places, all due to torrents of rushing water during successive rainstorms this year. Water flows from the east, chewing out large tracts of sand on the beach and, less easily seen, under the promenade rebuilt last year. 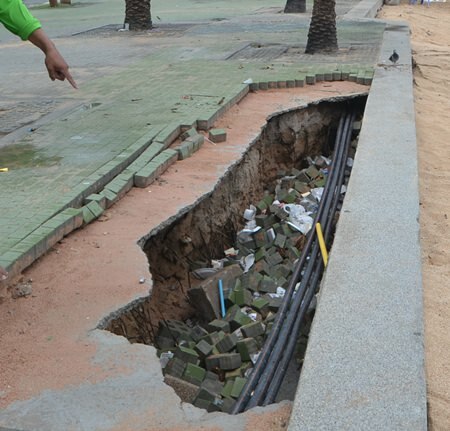 Residents, tourists and business owners are complaining Pattaya City Hall has taken no action on the problem, even though the holes pose serious safety hazards for pedestrians and bicyclists. Speedboat captain Weerayuth Boonkaya points out the holes in the recently rebuilt beach promenade are particularly dangerous, especially at night. One of the holes in the worst-hit area has grown so large, it could hide 10 people. Beach barriers have collapsed, allowing waves to crash on the sand. Beach vendors have resurfaced their own areas in order to set up their deckchairs. Weerayuth Boonkaya, a speedboat captain, said that the holes appeared months ago and were caused by erosion from rainstorms. It is obviously dangerous for tourists walking by, especially at night, he said. He urged the city to tackle the problem, as the problem will only get worse once rainy season sets in.